So, it's the 21st century, and much of my life is digital. I have a hard time reading a real book, watching live TV, my watch tells me more than just the time, etc... So it takes you a second to realize that when you look at the element of security of those devices from the outside world is just a large hunk of wood with a deadbolt. 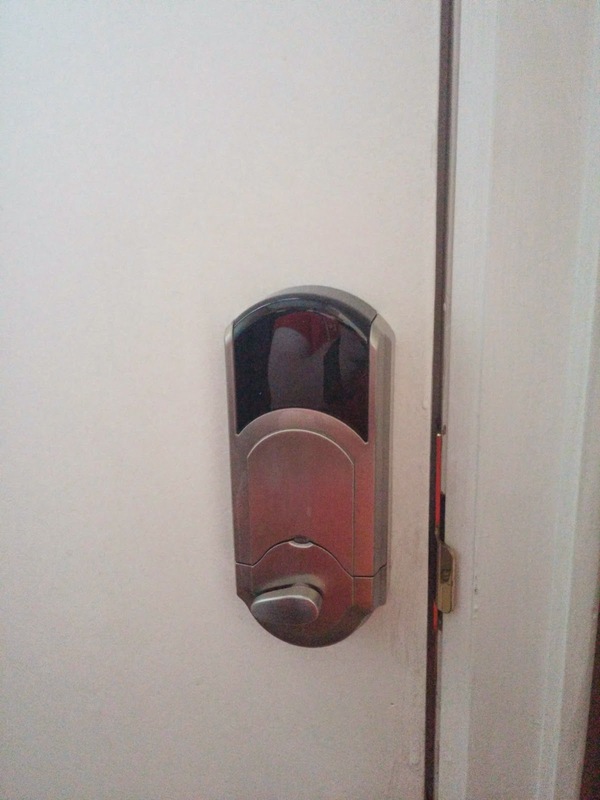 When I go to a hotel, they let you use a swipe card to enter your room; the lab at my university and my office now use RFID fobs to unlock the door; and I feel just as secure with those mechanisms as the one protecting all my really important stuff. It's time for an upgrade. Welcome to Kevo, the Smart Lock. TL;DR - it really makes you feel archaic having to get out a physical key, put it into a special tumbler, rotating it in order to open a door. I installed it myself. Dean went WHOAH. 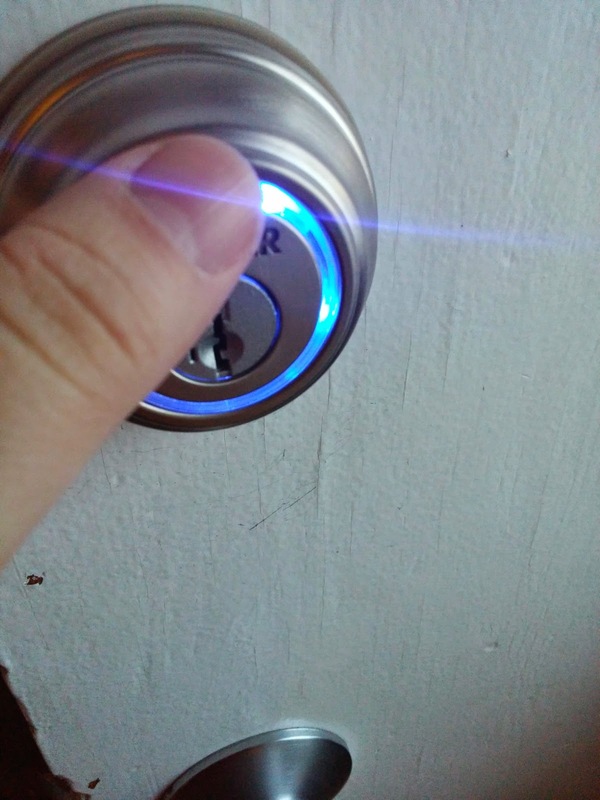 Sure, he was saying that because I touched the deadbolt 'rose' and it lit up; but I like to think that it was because I installed it myself. All by myself. Once installed physically, it looks impressive. But it acts just like the previous deadbolt we had, except this one was bigger on the inside (heh... TARDIS joke). And that's what makes it smart, so let's figure out what we can do with it. With the fob, you could tap the deadbolt and it would automatically lock, or unlock. Very cool. But not as much different from putting the key in and turning... so to make it even cooler you can calibrate the fob to your device so that you don't have to tap the fob, just have it near you and when you tap the lock it'll unlock. That's handy! It was also a lot of fun walking outside of my house at night, going about 20' away and then walking back towards the door to test. That alone makes it cool... and as I said above, makes you feel pretty archaic having to use a key (my wife gets the one fob, I ordered a second). Being able to re-key the lock to the same that we use on the back door and the shed is really handy (going to have to redo my handle/knob lock to a lock that can be re-keyed). But to really bring it into the 21st century, let's get our phones involved. The box isn't exactly inviting as when you look at it, it shows that it's only compatible with iPhone (and it goes back as far as the iPhone 4s). It takes going to the website for support that you see there's an Android version (don't search the Play Store, I couldn't find it myself, I had to go in through the site to get the direct link for the app). One of the things you learn when you go in through the site is that it only supports very few devices. It lists Nexus 6, Nexus 9 and Galaxy S5. I was a little upset (especially as they say the S5 is lollipop, but it's not yet here in Canada). When you go to the app you can see that there's a Google Forum set up where you can discuss it with the developers and other users. There you'll learn that the HTC One M9 is now added and the Moto X (2014 edition) with some issues. The rest still aren't listed. I'll give the developer kudos for addressing each and seemingly every concern raised on the forum. Great work David! So hopefully it means the list will grow. The issue comes in to the fact that in order to work the app needs Bluetooth LE peripheral mode. Not every device does that apparently. 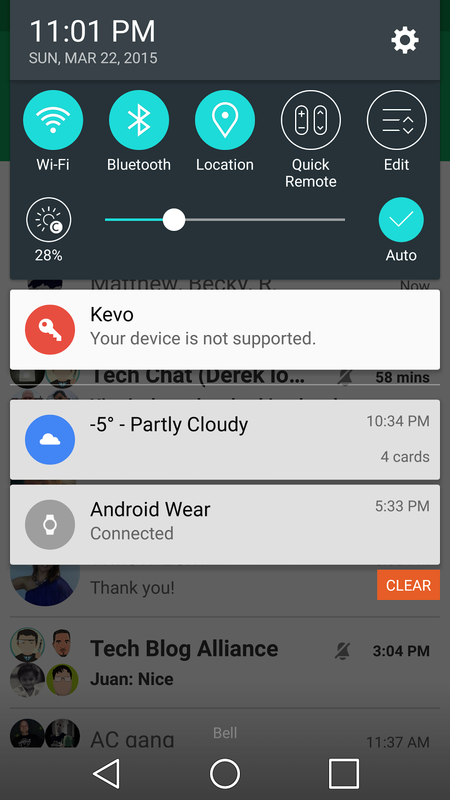 However, Lollipop seems to allow that to be enabled. 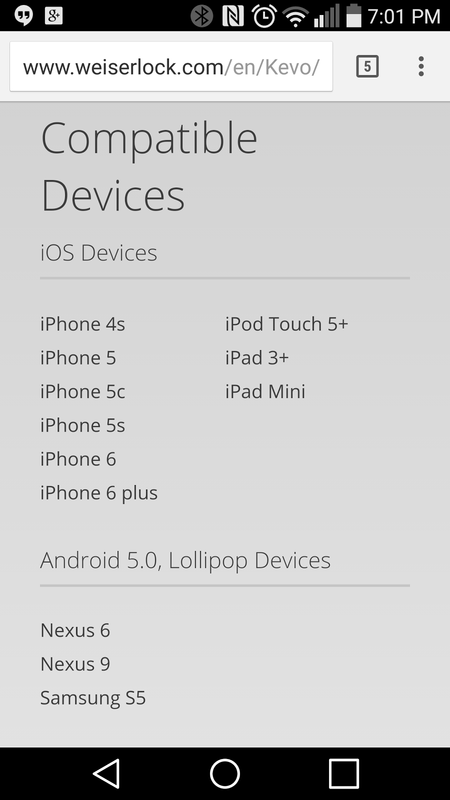 So with the G3 just being recently updated to the lollipop guild, it probably will be a while yet. But I'm hopeful. The app, allows you to have the device act the same as the fob... with it in range it'll allow the lock to unlock with just a touch. From the app you can also set up your eKeys (i.e. allow access to others with the app). What's really neat is that you can assign others with the eKey and tell the system when it's good and when it's not (i.e. if you want someone to go and walk your dog for you while you're away, instead of giving them a key to the house for ANYTIME THEY WANT, you can allow their device to access on specific days at specific times). The only issue is then that they'll need to have an approved device as well. I don't have one, even when I got my hands on an APK the system just kept telling me I'm not using a compatible device (makes me a sad panda). Logging in to the website and setting up my own account is still a bit of an empty win as it says I don't have a Kevo (there's no option to just input the serial number of my device... it has to be done through the app). 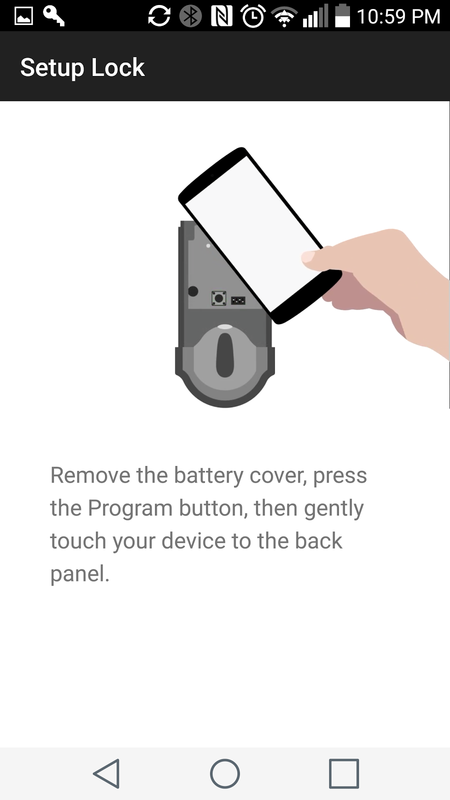 The lock also has indoor/outdoor sensors, to know when a fob is inside the house, vs. outside; so that if once you go inside and re-lock the bolt, but are standing near the door someone can't just come up and tap the lock to unlock it. 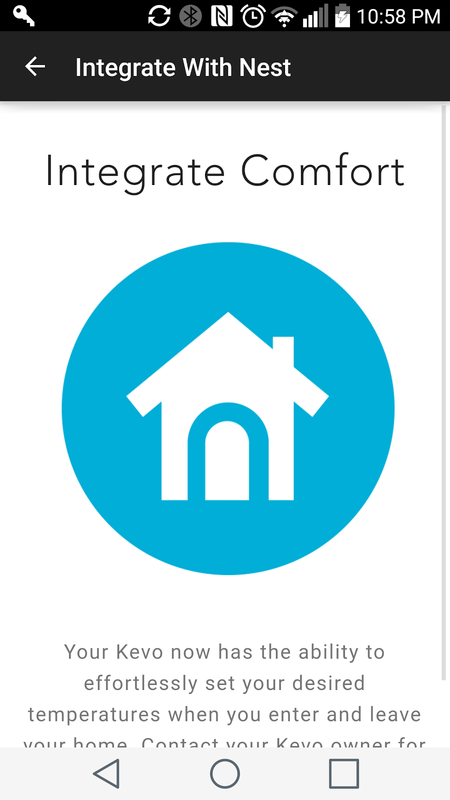 Interestingly enough the app even includes integration with Nest so that it will know when you're 'inside' and 'outside' so that it'll adjust temperatures of your house for you. 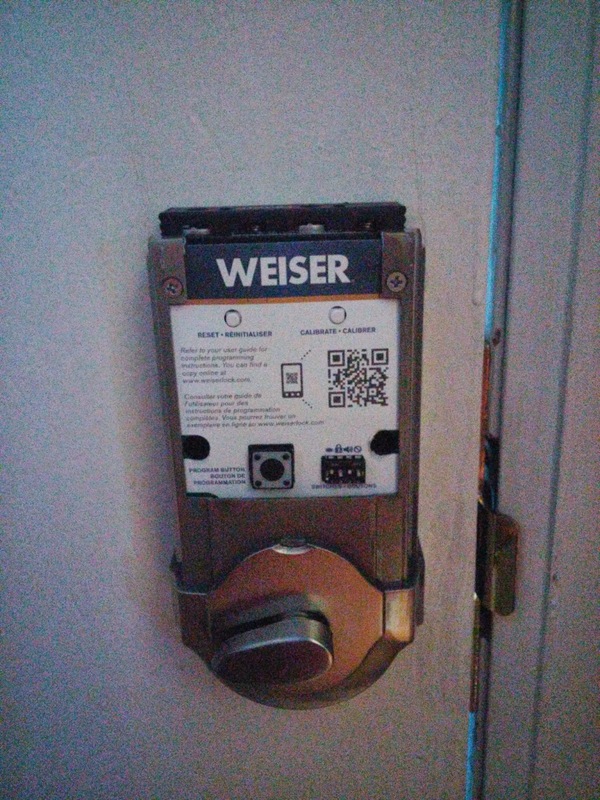 The door mechanism is powered by AA batteries and they say it should last about a year (the fob uses a CR2025 'coin battery' and should last at least the same). It's very cool - just wish it were available with more phones (and it's not really the fault of the manufacturer tho'). What would even be neater is if I could use my NFCRing.com on it. But that's asking too much.